The next time you taunt a colleague for taking the stairs instead of the elevator, hold on and suppress the thought, because that colleague may be just on to something. All you need is just a few minutes of climbing stairs at short intervals throughout the day to improve your health. The research that was published in the journal, Applied Physiology, Nutrition and Metabolism, called this approach an ‘exercise snacks’ and said how it is easy to incorporate into anyone’s day. Martin Gibala, a professor at McMaster University in Canada said, "Those who work in office towers or live in apartment buildings can vigorously climb a few flights of stairs in the morning, at lunch, and in the evening and know they are getting an effective workout,"
Previous studies had shown that brief bouts of vigorous exercise, or sprint interval training (SIT) are effective when performed as a single session, with a few minutes of recovery between the intense bursts, requiring a total time commitment of 10 minutes or so. For the purpose of the study, researchers wanted to check how effective was an SIT exercise snacks or vigorous bouts of stair climbing performed as single sprints spread throughout the day. The participants of the study were divided into two groups. 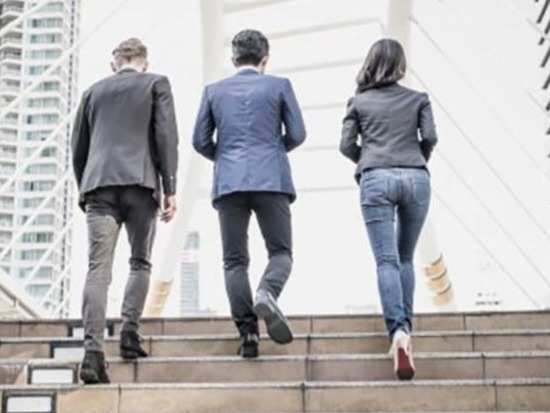 One group of sedentary individuals vigorously climbed a three-flight stairwell, three times per day, separated by one to four hours of recovery. They repeated the protocol three times each week over the course of six weeks. The researchers compared the change in their fitness to a control group which did not exercise. "We know that sprint interval training works, but we were a bit surprised to see that the stair snacking approach was also effective," said Jonathan Little, an assistant professor at the University of British Columbia in Canada. Apart from being more fit, the stair climbers were also observed to be stronger when compared to their sedentary counterparts at the end of the study and generated more power during a maximal cycling test. In the near future, researchers plan to investigate how different exercise ‘snacking’ protocols have different recovery times and how it affects the overall health and glycemic control. These tips and tricks will help turn you into a gardening pro in no time! 5These tips and tricks will help turn you into a gardening pro in no time!